Hello everyone, been a while since the last update but August is generally our ‘holiday’ month. It was a shame we were not involved in Hull Folk Festival this year but we’re hoping to be involved in the future, and there’s a possibility we might hold a workshop at Fruit at some point. 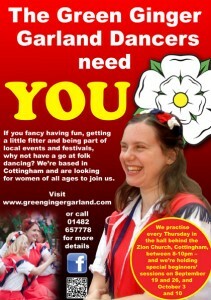 We’ve also just joined Twitter, so do spread the word and follow us @GGGDancers … This week we’re practising for Lincoln BIG Festival on Saturday, it’s our AGM on Sep 12, and in the following four weeks (Sep 19 & 26, Oct 3 & 10), we’ll be tailoring our sessions to beginners, so please come along!